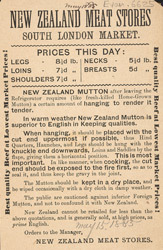 In the late 19th century, New Zealand gained a reputation in Britain as a major exporter of quality meat. This reputation was built on the success of a 1,320-ton sailing ship, the Dunedin, which had a refrigerated storage area built into it in 1882. The ship's first such cargo to Britain comprised the carcasses of thousands of New Zealand's best sheep and lambs. It sailed 12,000 miles in very hazardous waters, but the lamb arrived in excellent condition and the entire consignment was sold within two weeks. Britain has been importing New Zealand lamb in large quantities ever since. The Dunedin, however, was lost on a voyage to Britain only three years after her momentous initial success.